*Disclaimer: I received an eARC of this book from Netgalley and Oni Press in exchange for an honest review. This does not influence my rating or the content of my review in any way. Have you ever read a book that made you wish you had something similar back when you were a teenager? That's what this book made me think once I finished reading it. I wish I had this book back when I was an awkward teen. The idea of the book is pretty simple: you have a regular teenage girl, Willow, working at a library in her spare time, that isn't popular, and is bullied, alongside her best friend, Georgia, by a group of really popular kids. After an incident in the library, she discovers some books, one of which carries her name. Once she realizes what this book really is, she takes it, and tries to write herself a better story. Simple, right? Something I most certainly would have done had I been in Willow's shoes. Because what teen doesn't want to escape those years, when it's all awkward, and when acne, bad hair days, not being noticed by your crush, and not being picked for one of the teams in sports class seem like the worst thing that could ever happen. But as simple as it may seem, it's also really complex. Because in doing so, Willow has to face the consequences of her actions, one of which is losing her best friend. The other visible effect of Willow altering her life in such a way is the signs that she has on her, some marks that look like lines made with a pen. I kind of get the symbolism behind it, but I would have wanted a bit more time spent on that aspect. I loved the fact that Georgia, Willow's best friend, lectures her on the fact that she's using this book to have an easier life, when she should find a different way to deal with life. 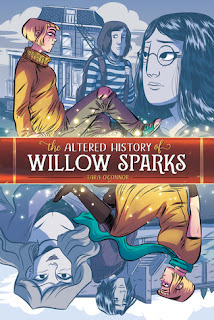 At the same time, Georgia is going through some changes in her life, and seeing Willow exchanging their friendship for the company of the popular kids in school hurts her enough to stop trying to reason with Willow. While the story itself is great, and some of the effects of Willow's tampering are mostly explored in this book, there were a few things that were left untouched, like the parents angle. I would have wanted Willow's parents to notice something. There's an interesting moment that shows the limitations of the book, but it wasn't completely explored. I am hoping that there's a volume 2 in the works, because the ending was a bit too abrupt. While I do remember how fights between friends resolved at that age (God knows I've had some of the most "epic" fights with my BFFs that ended in tears 5 minutes afterwards and promises to never fight again), I feel like Willow needs to face the school crowd without the help of the book, she needs to be exposed to the same popular kids after she returned her book. I'd love to see how she's going to do that. Aside from that, there's a wonderful moment of someone having a crush on somebody, and it turns out that somebody is a gay character, and it's a beautiful conversation between friends that warmed my heart, really. The artwork is pretty simple. It wasn't the best I've seen, but it's cute and it's in line with the story. The drawings are black-and-white, which is a nice change for me. The panels were easy to follow, and they weren't too crowded by dialogue. I liked the fact that the author shares, at the end of the book, a little bit of this book's history, with the changes in artwork that went on over the years. I've said this before, but I really enjoy seeing this behind-the-scenes type of segment in comic books. Overall, this was a pretty good book, but I would have wanted a bit more. I hope the story will be continued in the future, and I'll definitely read the next volume if and when it comes out. This book sounds amazing! I absolutely understand what you mean about wishing you found a book earlier, or that it existed when it would have meant everything to you as a younger person. I usually try to make myself feel better by making sure those books find their way to a classroom library or something similar so teens now can enjoy them. Great review! Right? I remember when I worked in a school up until last summer, I was able to introduce some teenagers to some really good books. I say some teenagers, because only a few of them were into reading unfortunately, and you can't always convince them to turn into readers :( But yes, helping teens find books when they need them is amazing.